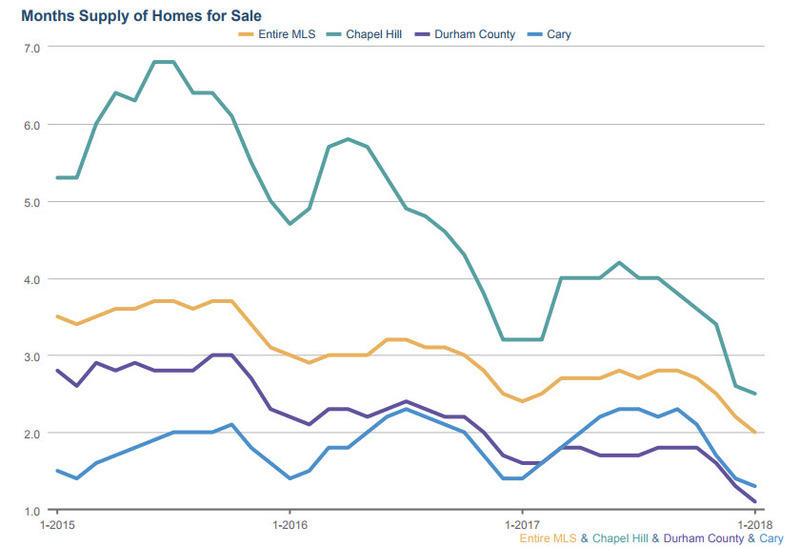 Real Estate Market Update: Sales prices in Chapel Hill, Durham and Cary are on the rise. 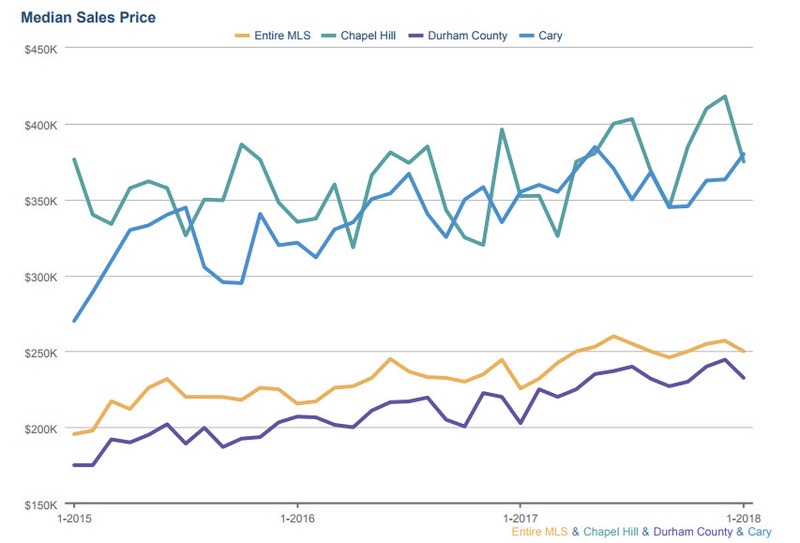 The three-year trend is excellent with median prices in Chapel Hill and Cary around the $400,000 mark. Houses in much of the rest of the Triangle, including Durham, are more affordable. Median prices in Durham, NC are about $250,000. Nationally, housing affordability remained flat for 2017. To view homes for sale in Chapel Hill NC, visit Real Estate Experts web site. Real Estate Market Update: Days on Market (DOM) have been are still are amazingly low. This means that overall houses are selling fast. In January, however, DOM have increased a bit. I think this is primarily due to a slightly slower start to the season and the weather. To be specific; in July 2017 Average DOM were 13 in Chapel Hill, 5 in Durham and 6 in Cary. In November 2017 this increased a bit to 33 in Chapel Hill, 8 in Durham and 10 in Cary. In January, this has stretched out a bit more to 36 in Chapel Hill, 10 in Durham and 14 in Cary. I expect to see these numbers come down as the season heats up. If you are looking for homes for sale in Durham NC, visit Real Estate Experts web site. Real Estate Market Update: The supply of inventory is incredibly low. I don’t remember a time when inventory was this low. In Chapel Hill there is less than 3 months of inventory and in Durham and Cary there is less than 2 months of inventory. This is truly an excellent time to sell. If you have been sitting on the fence, with inventory low, it is a sellers market. Prices are rising. With interest rates still low, buyers are moving on the opportunity before prices rise further. If you are looking for homes for sale in Cary NC, visit Real Estate Experts web site. As we near the end of 2016, real estate market trends for the Triangle and surrounding areas are improving: closed sales are up; median and average prices are up; days on market (DOM) are down; list-to-sales price ratio (how close sellers get to the list price) is up; and inventory is down. This is all good news. It helps to take a deeper dive and look at the numbers by market area – there are real differences. 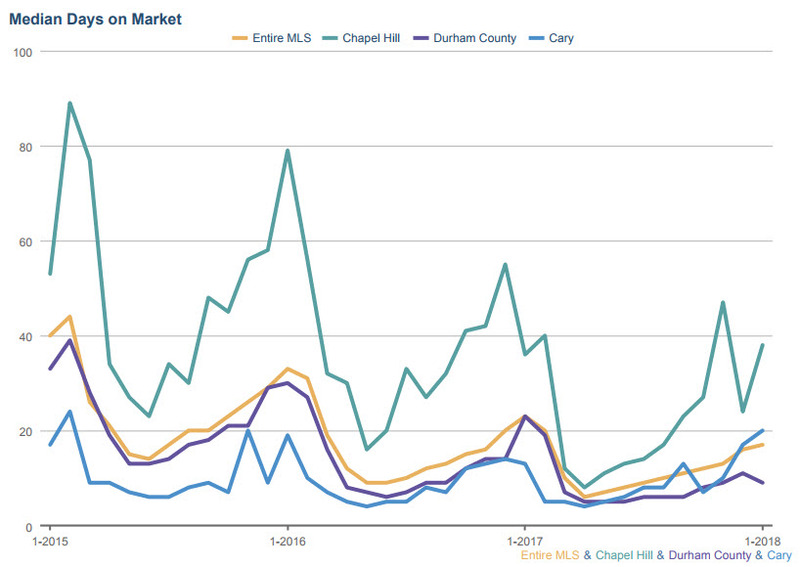 Homes for sale in Chapel Hill are up 11.5%, plus average and median sales prices are up 2.9% and 3.2%, respectively. But Chapel Hill homes average the longest number of days on the market, 79, compared to 39 in Wake County, 37 in Raleigh, and 29 in Cary/Apex/Morrisville. Chapel Hill also has the second largest inventory on the market, next to Chatham County. Durham real estate is doing very well. Closed sales are up over 10%, median and average prices are up close to 10%, and days on the market is under 40! In addition, inventory is hovering at around two months. Clearly, we need more inventory come on the market in Durham. The real estate market in Cary, Apex, and Morrisville is smoking hot. All indicators are up, and the average days on the market is 29, with less than two months of inventory on the market. This is amazing! There’s no doubt that the market has improved in 2016. If you have been thinking about selling, give me a call today at 919-697-5014. I am happy to do a complementary analysis and inform you how your house stacks up against these averages. Circumstances vary in different locations and price ranges. As a real estate expert with 20 years of experience in analyzing the Triangle real estate market, I tell it like it is. My role is to give my clients honest feedback as to whether it makes sense to sell or sit tight. I’m here for you! For more information on the real estate market, visit www.RealEstateExperts.net. The report, released on May 23, 2016, looked at 25,262 luxury homes which have been on the market for an average of 150 days. The ILHM Luxury Composite Price this week was $1,558,269. The Market Action Index measures supply relative to the current demand, and an index market above 30 indicates that conditions favor the seller. 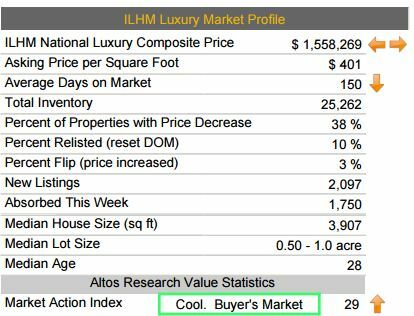 Across the ILHM national sample, luxury home prices have remained stable in the past several weeks. This week, the median price is $1,558,269. Changes in how luxury homes are valued–as well as how they are being constructed–can be measured by viewing changes in price per square foot. The current median price per square foot for luxury homes is $400. Home prices are a function of supply and demand, and market conditions are characterized by looking at these factors. The ILHM national market is currently barely in the Buyer’s Market zone (below 30). With this week’s Market Action Index of 29, luxury buyers should see reasonable levels of selection. Inventory data indicates the number of properties for sale in a given real estate market and will fluctuate seasonally. The Market Action Index (above) will allow you to gauge demand levels relative to inventory. As inventory increases or demand falls, the Market Action Index with quickly drop. The chart below shows teh total number of homes in the ILHM sample each week. These homes are listed for at least $500,000 in the top 10 zip codes for 31 major metro markets across the country. Days on Market data indicates the health of the market and how long you might expect it to take to sell a home. Or, how quickly you should make an offer on a home you are considering purchasing. The properties in this report have been on the market for an average of 158 days. Finally, the chart below provides a look at the local luxury markets across the country. As you can see, the Market Action Index in Raleigh-Durham is currently elevated. For more information about this report, or any of your real estate questions or needs, contact Real Estate Experts any time at 919-813-6449 or [email protected] Visit us online at realestateexperts.net.